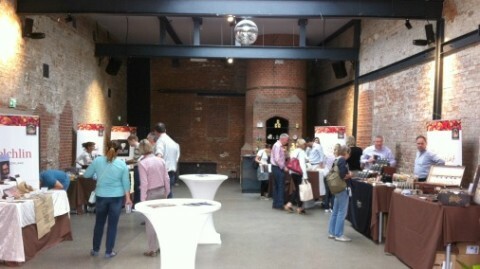 It's only a short hop to the Gourmet Chocolate Festival in Hannover, and lots of award winning chocolates! Friday the 16th September saw me on a plane to Hannover, Germany. 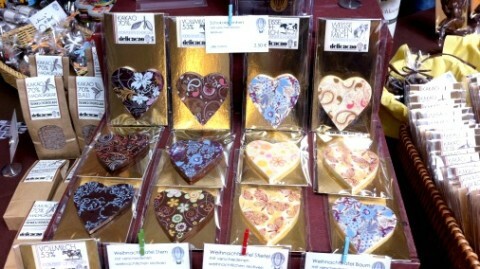 I was on my way to the third, annual Gourmet Chocolate Festival, which ran from the 16th to 18th. The awards ceremony for the 2016 German/Austrian/Swiss heat of the International Chocolate Awards was to be held that evening within the festival, and I was doing the honours along with Michaela Schupp, German partner of the awards and dynamo behind the festival. 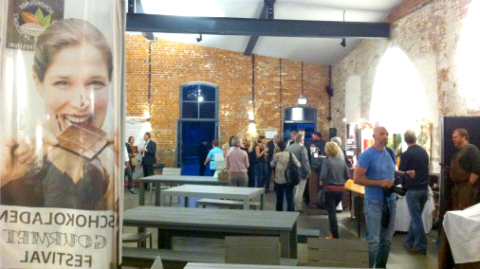 One of the stunning, utilitarian-chic halls at Helmke Hof. Michaela is also founder of Chocolats-De-Luxe, a fine chocolate shop which she runs from within a glorious building on Helmke Strasse. The collection of red brick buildings, now dubbed Helmke Hof, were once a rubber factory. They have been beautifully reinvented into a work hub housing various cool creative companies, and there is space to spare for events like the festival. 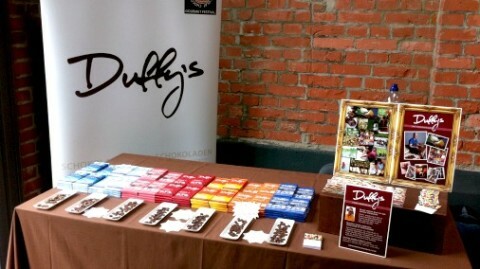 Representing the UK with superb chocolate, Duffy’s! I was delighted to be greeted on arrival by familiar faces. Duffy Sheardown and Mikkel Friis Holm had both flown in for the event, and I was thrilled to start off chocolate season with two old friends and such excellent chocolate. 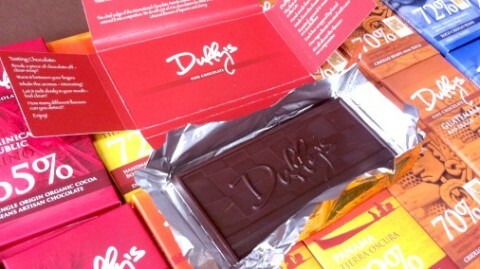 Duffy’s beautiful new moulding and packaging make his bars even more desirable. I was excited to taste the new Guatemala bar. Using the same variety of beans as his famous Indio Rojo bar this is a lesson in terroir. The delicious new bar is packed with notes of green banana, with hints of honey and pepper, and is altogether more assertive than the justifiably sought after Indio Rojo. 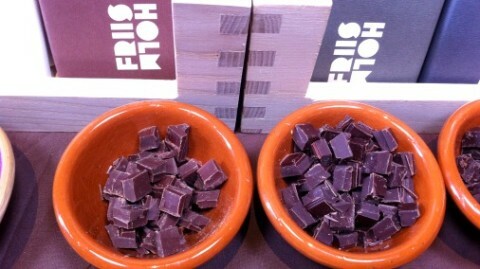 Always a welcome sight, Friis Holm chocolate! Friis Holm’s stand is always a visual treat. 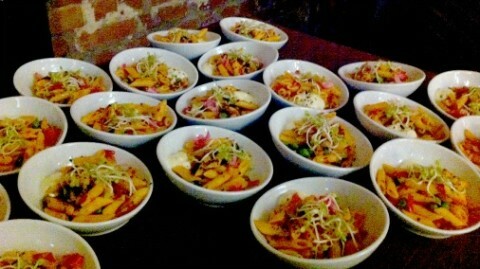 I can assure you I sampled everything! The wrappers are a lesson in Danish cool, but I was struck by these two 70% dark samples and had to take a picture, the colours were divine. The contrast in colour isn’t clear enough on my picture, but trust me, the Johe 70% dark chocolate on the left was almost like a milk chocolate, light and creamy, while the La Dalia 70% dark chocolate on the right was deep brown. Evidence of the difference in two different cacao varieties. Both were delectable! The true connoisseurs lust-have item. For me another Friis Holm product is set to be one of the key stories of the season. I have lost count of the number of times I have intrigued and delighted people with Mikkel’s Double Turned and Triple Turned 70% Chuno bars, the minute difference in processing producing such marked difference in the taste of two otherwise identically processed chocolates. 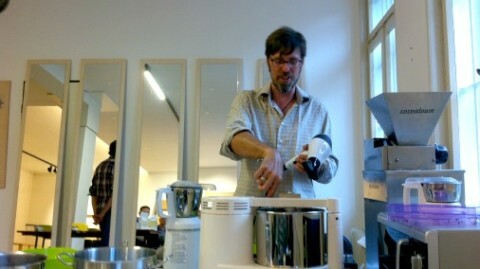 Mikkel has done it again with Rugoso single bean 70%, and Rugoso single bean 70% Bad Fermentation. Again the two chocolate have only one difference, and that within the fermentation. The ‘Bad Fermentation’ refers to the reaction Mikkel observed in other chocolate makers to a batch of beans containing only 25% of beans that were deemed to be correctly fermented. 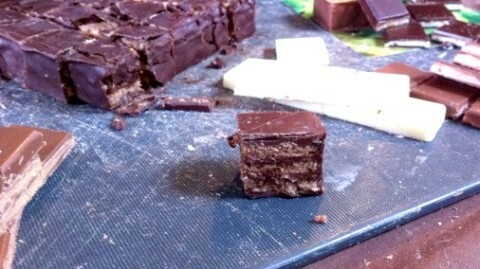 Having a go at making chocolate with the results has produced two delicious and strikingly different bars. Both bars are utterly worth savouring; rethinking ‘bad’! With this new package, holding four 25G bars, one of each of the bars mentioned here, Friis Holm have put together an exceptional taste journey with stunning insight into the kind of fine tuning chocolate makers are starting to play with today. It is always good to see Pacari, and pick up some of their oh so addictive chocolate covered golden berries and of course their signature raw bars. 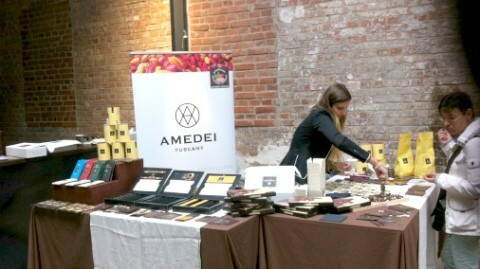 The international presence continued with Amedei; the Italian chocolate player. 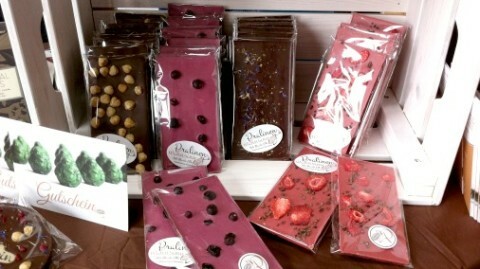 Their stand had a good range of their single bean and blended bars, and also flavoured bars and pralines. 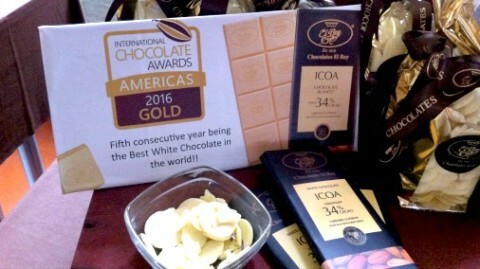 From Venezuela, El Ray were proudly displaying their International Chocolate Awards gold medal winning Icoa white chocolate. El Ray were celebrating their anniversary with a special edition bar. 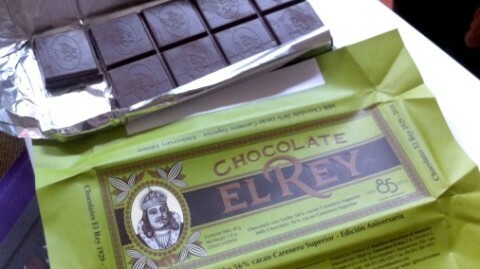 El Ray also had this beautiful special edition bar, celebrating their 85th anniversary. But I was proud to see the International Chocolate Awards achievements taking pride of place, not just on the El Ray stand, but on so many of the elite band of chocolate makers and chocolatiers in Hannover. Let’s get this party started – the awards ceremony guests start to arrive. With many of the German, Austrian and Swiss award winning chocolatiers on hand, we had a full and happy crowd for the awards ceremony. The major of Hannover joined us for the evening, to honour our event. The after-party was tasty, and it wasn’t just chocolate! As the winners clutched their certificates we settled at tables with wine, lots of great food, and plenty of local pride. The German/Austrian/Swiss round was celebrating its third year, during which time it has doubled in size and become the largest heat in Europe. 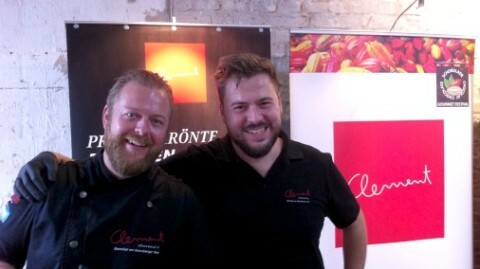 The brothers ‘Clement’ have a lot to smile about! 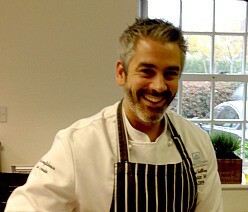 With no less than ten awards this year Clement Chococult had an awful lot to smile about. I was thrilled to meet the faces behind the wonderful chocolates, father Frans Xaver Clement and his sons (above). I have tasted their delicious products in competition, but this was my chance to see more of what they do, and taste across their range. 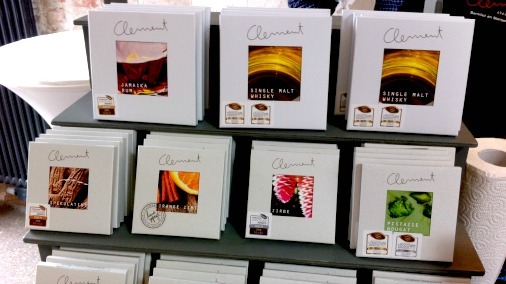 Their chocolates are all made with fine Swiss chocolate from Felchlin, which does fine justice to their exceptional filled bars and pralines. Their whisky and dark chocolate bar won a gold award at the world finals last year. Its new cousin, a milk chocolate bar with Jamaica rum looks set to join it on the podium. All their work is technically pleasing, with superb fine textures, and crisp delivery. The flavours do not disappoint. I also enjoyed tasting two bars using orange. An orange and yoghurt filling was fresh and light for summer. The autumn version takes the theme to a warmer place with a lightly spiced orange ganache. Both clever and very well flavoured. Clement’s ‘Cult’ cake – form an orderly queue. An absolute hit is the ‘Cult’ cake. This is Clement’s reinvention of a Baumkuchen, a classic German layered cake. The original is formed with multiple layers of batter, set around a rotating spit. The end result is a tall trunk of a cake, hence the name ‘tree cake’. This Clement version is layers of soft biscuit, enhanced with walnut and interleaved with plain dark chocolate ganache, and an orange and dark chocolate ganache. The ‘Cult’ cake interior – layers of heaven. It is a total treat; managing to be both rich and light, full flavoured and delicate. Cult status to follow! It was literally fought over in my house. 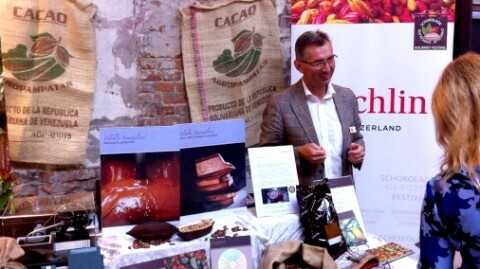 Swiss fine chocolate maker Felchlin had lots to sample. Alongside the Clement stand were Felchlin, with some of the fine couvertures that are so well showcased in Clement’s work. They had a particularly interesting wild Bolivian dark chocolate, made with two different conching times. It surprised me how very much more developed its creamy and walnutty flavours had developed in the 60 hour conched bar, as oppose to the 48 hour. 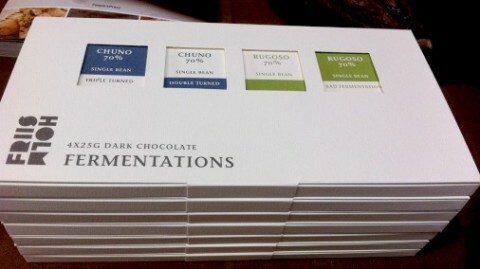 All their chocolates show their long developed Swiss expertise and balance. Austrian bean to bar chocolate maker Zart. 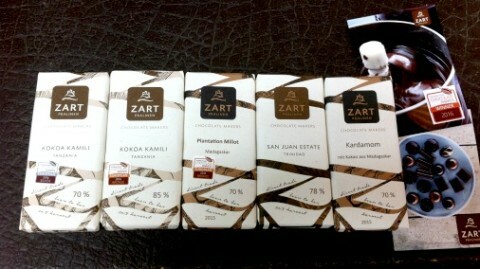 A new one to me, I hugely enjoyed discovering Zart, a chocolatier and bean to bar chocolate maker based in Austria. 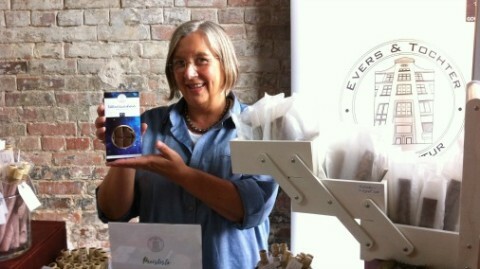 Both their truffles made with couverture, and their elegantly styled bars, have already won awards. 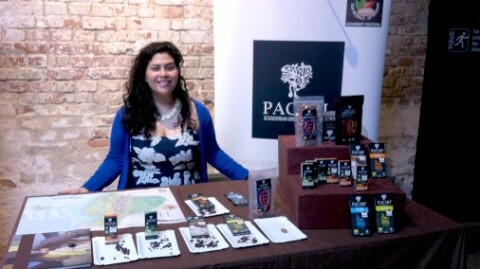 The flavours are clean and intense, and show real understanding of the cacao used. Lots of awards for Zart! It is definitely a case of watch this space with Zart! I want to know and taste more of what they do and will keep you posted. Gold medal winning spread from beckscocoa. Beckscocoa are a hot chocolate specialist, and they were busy keeping festival goers happily lubricated. But their gold award winning product was their chocolate hazelnut spread, held proudly aloft above. 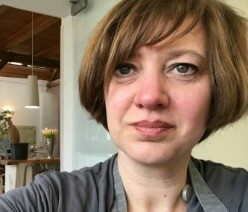 Chocolate with heart – Angela Evers from Evers & Tochter. Evers & Tochter was started ten years ago by Angela Evers, selling crystallised flowers made from those grown in a garden of the 700 year old house that is her home and inspiration. The garden was established by her grandfather and family and love is clearly at the heart of all she does. 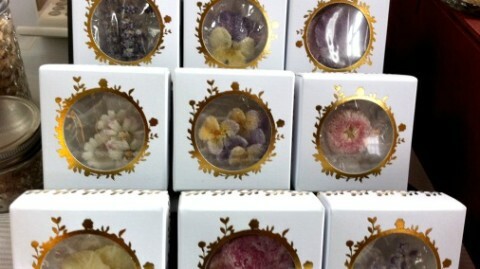 Beautiful crystallised flowers at Evers & Tochter. 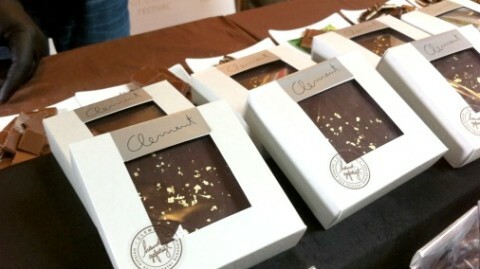 She began to work with chocolate, using couverture from excellent Michel Cluizel, more recently. 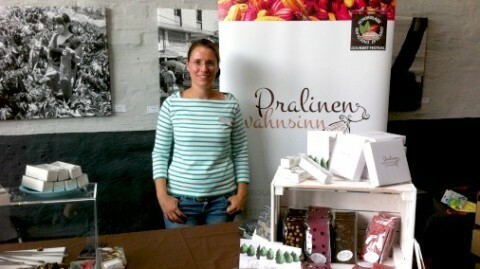 At the first Hannover Gourmet Chocolate Festival, held three years ago, her chocolate offering was only two weeks old. Finding herself amongst established names she felt some trepidation, but needn’t have worried. 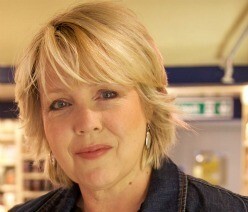 Her flavoured bars are already winning awards, with her milk chocolate and truffle bar scooping a silver medal at the world finals in 2015. 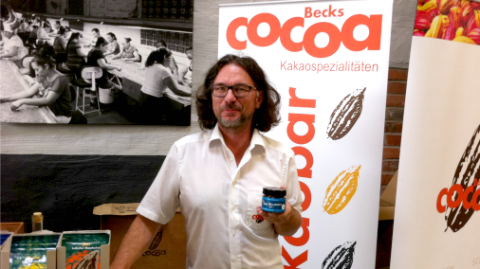 Delicacao – award winning German bean to bar. 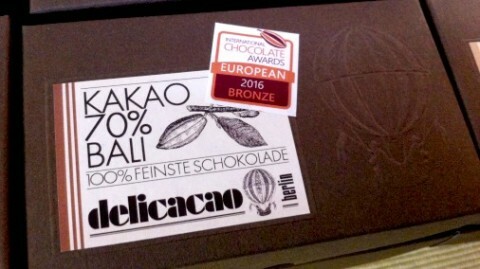 Another award winner, delicacao are a bean to bar chocolate maker and chocolatier based in Berlin. They work with beans that are processed to liquor in Bali, and then complete the process in Berlin. They are also now making chocolate for the local market in Bali. Along with their different bars they produce many gift shapes and ideas. One of the most interesting aspects of their bean to bar work is the high percentage of their milk chocolates made using goat’s milk. Nele Marike Eble from PralinenWahnsinn. Nele Marike Eble is so new to working with chocolate that she wasn’t in a position to enter this year’s awards. But judging by the buzz around her stand she will be well on her way for 2017. Colour and flavour from Pralinenwahnsinn bars. She works only with Original Beans couverture, and flavours her bars with bright and fresh fruits that she processes herself. The strawberry bar I tasted had good flavour, and the dried strawberry was truly delicious, so much nicer that the usual sour dust that all too often passes for strawberry. Nat Bletter of Madre Chocolate shows us how it’s done. 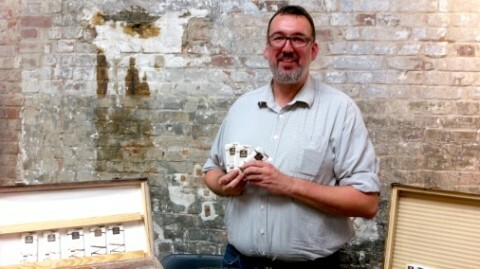 Last, but very far from least, special mention goes to Nat Bletter from Madre Chocolate. I was thrilled to finally meet Nat, not only because he was extremely gallant in helping me to find a taxi during my pre-flight flap on the last day. Nat is founder of Madre Chocolate in Hawaii, whose signature Triple Cacao bar is something that every chocolate lover should try. It combines his excellent chocolate with cacao nibs and cacao fruit. Including both pulp and nibs in the bar makes for a glorious set of tastes and textures, and a beautifully complete exploration of the flavours of the cacao. I was lucky enough to attend a bean to bar workshop Nat gave during the festival. His calm instruction and passion for making chocolate were wonderful to experience. Both Nat and Madre Chocolate are something I wish to tell you more about, so I will save a fuller story for a future post. 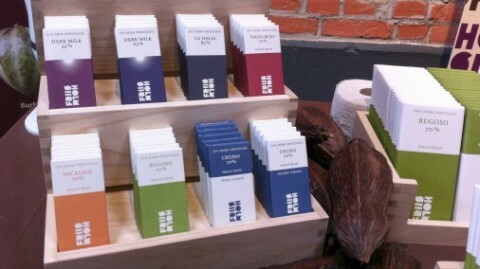 But in the meantime do seek out Madre chocolate, and in particular that Triple Cacao bar.